Entomopathogenic fungi such as Beauveria bassiana, Isaria fumosorosea, and Metarhizium brunneum play an important role in managing several arthropod pests on multiple crops. Multiple genera of entomopathogenic fungi are available as biopesticides and used in organic and conventional agriculture. Compared to chemical pesticides, entomopathogenic fungi-based pesticides are expensive. While they are excellent tools in integrated pest management (IPM) approaches against several pests, their high cost relative to chemical pesticides can be a hindrance to their widespread use. Exploring their multipurpose use in promoting plant growth and protecting plants from pathogens can increase their acceptance as farmers can get multiple benefits beyond arthropod management when they use entomopathogenic fungi. Some studies showed the positive impact of entomopathogenic fungi on promoting plant growth and health (Sasan and Bidochka, 2012; Dara, 2013; Dara et al. 2016). Other studies that demonstrated antagonistic effect of entomopathogenic fungi against non-arthropod pests include, B. bassiana against Fusarium oxysporum and Botrytis cinerea (Bark et al., 1996) and Rhizoctonia solani and Pythium myriotylum (Ownley et al. 2008), Lecanicillum lecanii (=Verticillium lecanii)against cucumber powdery mildew, Podosphaera fuliginea (=Sphaerotheca fuliginea) (Askary et al., 1998), Lecanicillium spp. against plant pathogens and parasitic nematodes (Goettel et al., 2008), M. robertsii against Fusarium solani f. sp. phaseoli (Sasan and Bidochka, 2013). These reports show the potential of entomopathogenic fungi in serving multipurpose role in improving plant growth and protecting against multiple groups of pests. A new greenhouse study was conducted to evaluate the efficacy of B. bassiana (BotaniGard), I. fumosorosea (Pfr-97), and M. brunneum (Met 52) in comparison with other beneficial microbe- (Actinovate and MBI 110) or plant extract-based (Regalia) products in providing protection against a plant pathogen. Cotton was used as the model plant and F. oxysporum f. sp. vasinfectum Race 4 (FOV Race 4) was used as the plant pathogen in this study. 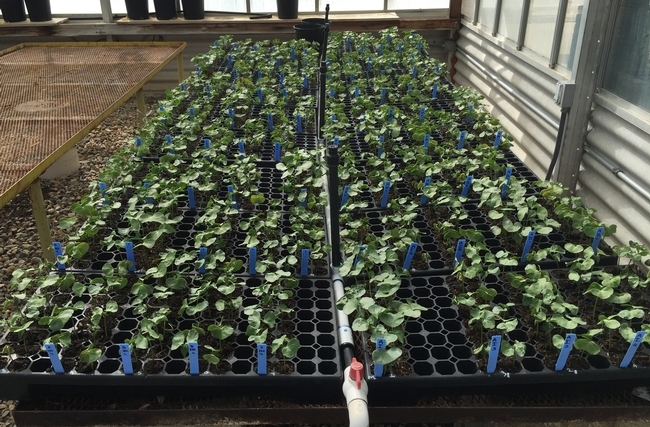 Pima cotton seed of the variety Phy830 (Phytogen) susceptible to FOV Race 4 were planted in potting mix 0.33X103 CFU/g of FOV Race 4 in seedling trays. Healthy potting mix was used as untreated control. Six products, listed below, were applied in three regimens based on foliar application rate (10 ml of the treatment liquid calculated based on 100 gallons of spray volume/ac) or soil application rate (10 ml of the treatment liquid with product calculated based on the surface area of the cell at the soil application rate per acre) to each cell of the tray. Each treatment had 16 cells (or seedlings) and was replicated four times. Treatments were applied in the following three regimens. Soil application rate was calculated based on the surface area of each seedling cell (2.25 square inches) compared to one-acre rate and delivered in 10 ml of purified water with 0.01% Dyne-Amic as a surfactant. Foliar rate was calculated based on 100 gallons/ac spray volume and each cell received 10 ml. 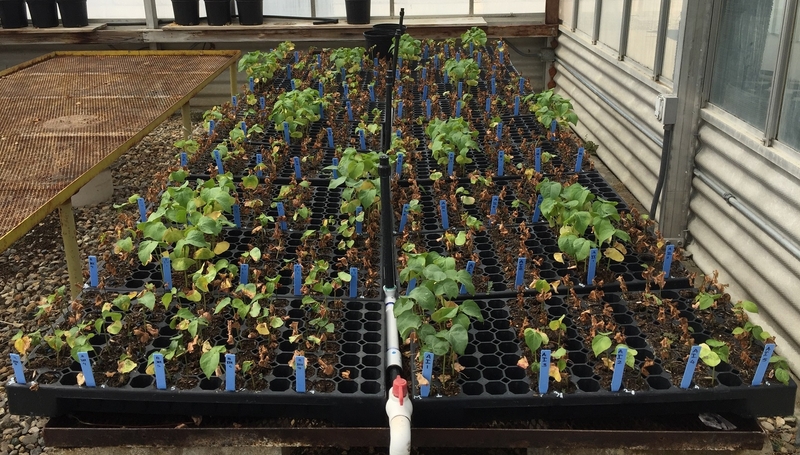 Untreated control and potting mix with plant pathogen received water with Dyne-Amic. Regimen A - 10 ml of water or treatment liquid at soil application rate administered right after planting cotton seed. Regimen B - 10 ml of water or treatment liquid at soil application rate administered right after and 1 and 2 weeks after planting. Regimen C – 10 ml of water or treatment liquid at foliar application rate administered right after planting. 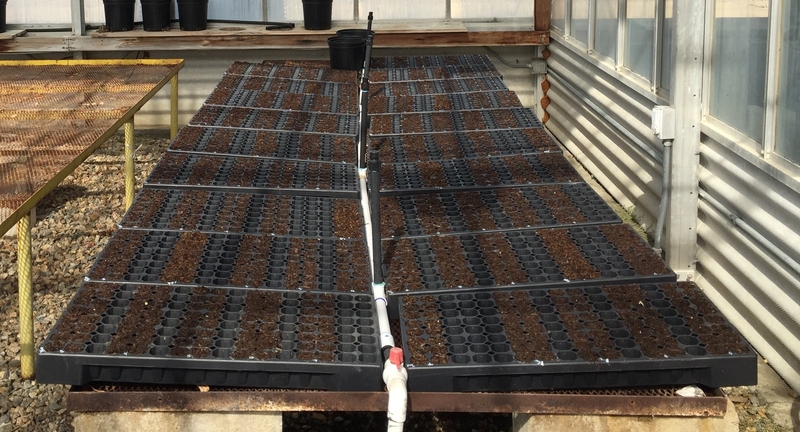 Seedling trays were arranged on a greenhouse bench and a sprinkler system irrigated trays for 5 min each day at noon. Plant health and growth conditions were monitored 3, 4, and 5 weeks after planting based on the following scale. Data were analyzed using ANOVA model and significant means were separated using the Least Significant Difference (LSD) test. Treatments were separated by an empty row to prevent cross contamination. Experimental set up at the time of planting (above) and 1 week after planting (below). Experiment 2 weeks after planting (above). Symptoms of Fusarium oxysporum f. sp. vasinfectum appear by the third week after planting (above) and advance by the fifth week (below). In general, there was a positive impact of treatments on reducing the severity of FOV Race 4 in cotton seedlings, but it varied with time and among treatment regimens. Negative control plants did not show any symptoms of infection – yellowing, necrosis, or wilting - and consistently maintained a high health rating of about 4.8 out of 5.0 (Table 1). Table 1. Plant health rating 3, 4, and 5 weeks after planting in three treatment regimens. 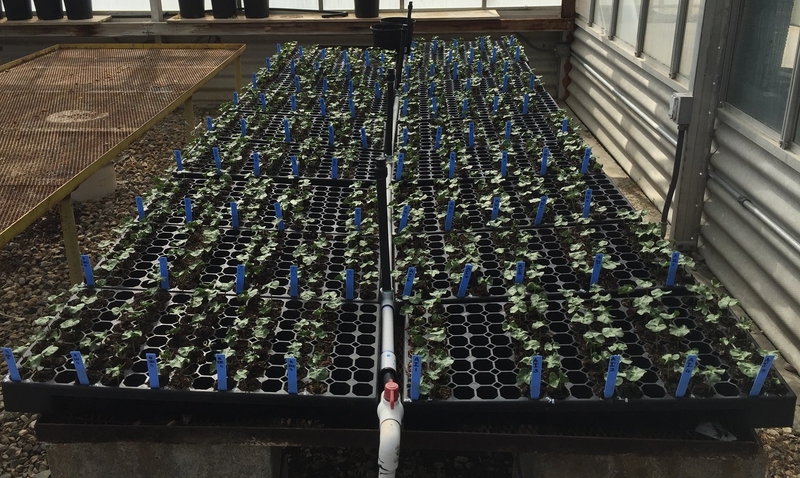 Regimen A: Treatments were significantly different (P < 0.00001) on all observation dates, but when negative control was disregarded, differences were seen only on the first observation date, which was 3 weeks after planting. Pfr-97, Met 52, and Actinovate resulted in a significant improvement in the plant health compared to the other treatments. On the following observation dates, plant health rating was higher in all treatments compared to the positive control with FOV Race 4, but the differences were not statistically significant. Refer to Table 1 for statistical significance between treatment means in Regimen A. Regimen B: In this regimen, where treatments were applied three times at a weekly interval starting from the time of planting, plants treated with Pfr-97, Met 52, and Actinovate a better health rating than the positive control throughout the observation period. MBI 110 was also better than the positive control 3 weeks after planting, but not afterwards. 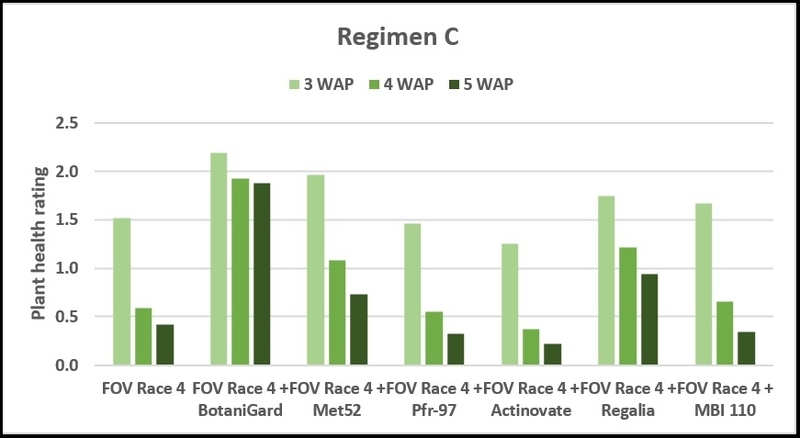 Plant health in Regalia and BotaniGard treatments was better than FOV Race 4 alone, but it was not significantly different. Refer to Table 1 for statistical significance between treatment means in Regimen B. Regimen C: This regimen aimed the impact of treating the soil with a higher concentration (based on foliar application rate) of treatments. 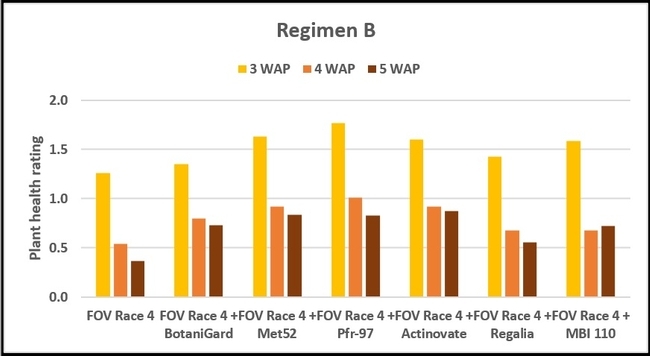 BotaniGard-treated plants were significantly healthier than MBI 110, Pfr-97, Actinovate, and FOV Race 4 alone on 3 weeks after planting and all the treatments (excluding the positive control) on 4 and 5 weeks after planting. Refer to Table 1 for statistical significance between treatment means in Regimen C.
Treatments compared among all regimens: When treatments were analyzed by combining all regimens, Met 52, Pfr-97, BotaniGard, and MBI 110 significantly improved plant health over FOV Race 4 alone, 3 weeks after planting (Table 2). 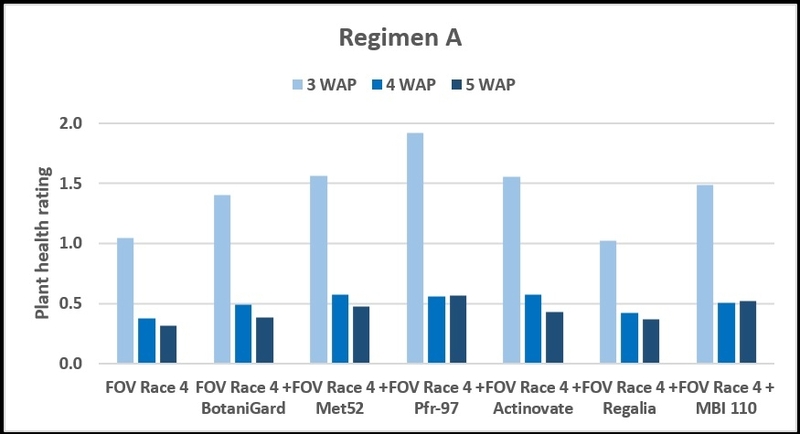 However, BotaniGard provided significantly higher protection than all other treatments against FOV Race 4 during the rest of the observation period. Table 2. Efficacy of treatments 3, 4, and 5 weeks after planting (WAP) when data from different regimens were combined. Comparing regimens: Data were combined among all treatments and analyzed to compare the efficacy of different regimens. Multiple applications of beneficial microbe or plant extract based pesticides at low concentration or single application of a higher concentration were better than single application of lower concentration especially 4 and 5 weeks after planting (Table 3). Table 3. Efficacy of different regimens against Fusarium oxysporum f. sp. vasinfectum infection. Results suggest that non-chemical treatment options used in the study provide some level of protection against the plant pathogen FOV Race 4. It is very important to note that one or more entomopathogenic fungi antagonized FOV Race 4 equal to or better than other products that are based on beneficial microbes or plant extracts known to have fungicidal effect. Bennett et al. (2011) compared endomycorrhizal product AM120 based on Glomus spp. with chemical fumigants (methyl bromide, chloropicrin, 1, 3-dichloroprepene, and metam-sodium) and solarization in multiple field studies. Efficacy of these treatments varied in different experiments and among cotton varieties. While conventional treatments typically provided superior protection against FOV Race 4, mycorrhizae at times was comparable to some of the other treatments in some instances. Even if fumigants are used before planting for a healthy start, periodic soil treatment with beneficial microbes could help maintain plant health for the rest of the crop season. This is the first study where B. bassiana, I. fumosorosea, and M. brunneum were compared with other non-chemical alternatives against a plant pathogen and demonstrating their potential in offering plant protection. These results shed light in a developing area of science where alternative uses for entomopathogenic fungi are explored. Additional experimentation with different concentrations of the plant pathogen and beneficial microbes would expand our understanding of their interactions. Acknowledgments: Thanks to BioWorks, Inc., Certis USA, Marrone Bio Innovations, Monsanto BioAg, and Valent BioSciences for providing biopesticide samples used in the study. Askary H., Y. Carrière, R. R. Bélanger, and J. Brodeur. 1998. Pathogenicity of the fungus Verticillium lecanii to aphids and powdery mildew. Biocon. Sci. Tech. 8: 23-32. Bark, Y. G., D. G. Lee, S. C. Kang, and Y. H. Kim. 1996. Antibiotic properties of an entomopathogenic fungus, Beauveria bassiana on Fusarium oxysporum and Botrytis cinerea. Korean J. Plant Pathol. 12: 245-250. Bennett, R. S., D. W. Spurgeon, W. R. DeTar, J. S. Gerik, R. B. Hutmacher, and B. D. Hanson. 2011. Efficacy of four soil treatments against Fusarium oxysporum f. sp. vacinfectum race 4 on cotton. Plant Dis. 95: 967-976. Dara, S. K., S.S.R. Dara, and S.S. Dara. 2016. First report of entomopathogenic fungi, Beauveria bassiana, Isaria fumosorosea, and Metarhizium brunneum promoting the growth and health of cabbage plants growing under water stress. UCCE eJournal Strawberries and Vegetables, 19 September, 2016. Goettel, M. S., M. Koike, J. J. Ki, D. Aiuchi, R. Shinya, and J. Brodeur. 2008. Potential of Lecanicillium spp. for management of insects, nematodes and plant diseases. J. Invertebr. Pathol. 98: 256-261. Ownley, B. H., M. R. Griffin, W. E. Klingeman, K. D. Gwinn, J. K. Moulton, and R. M. Pereira. 2008. Beuveria bassiana: endophytic colonization and plant disease control. J. Invertebr. Pathol. 98: 267-270. Sasan, R. K. and M. J. Bidochka. 2012. The insect-pathogenic fungus Metarhizium robertsii (Clavicipitaceae) is also an endophyte that stimulates plant root development. Amer. J. Bot. 99:101-107. Sasan, R. K. and M. J. Bidochka. 2013. Antagonism of the endophytic insect pathogenic fungus Metarhizium robertsii against the bean plant pathogen Fusarium solani f. sp. phaseoli. Can. J. Plant Pathol. 35: 288-293.